Costa Rica is extremely diverse in nature, climate, culture, and geography. But something that you don’t hear a lot about is the population of Costa Rica. Believe it or not, Costa Rica doesn’t have a large number of people. The number of inhabitants peaks at just under five million people. 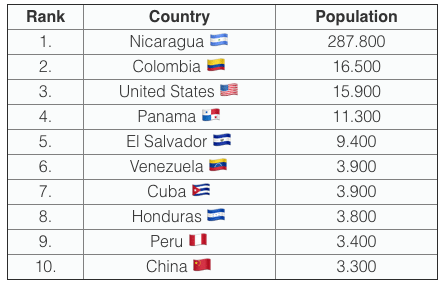 Its population stats are just under Nicaragua at six million and just above Panama at 3.8 Million. The population is increasing by about 1.5% a year which means that there could be almost 10 Million people living in Costa Rica in 50 years. Approximately 60% of the Ticos live in urban areas. Although Costa Rica has a rather small population, you can find a lot of diversity. For example, there are many immigrants from Europe, North America, Asia and South America throughout the country, and on the Caribbean side you’ll find many Afro-Caribbeans from Jamaica. There are also a few indigenous tribes in Costa Rica, including the Bri Bri, Boruka, Maleku and Matambú. The ancestry of most Costa Ricans stems back thousands of years. A small portion of the bloodline comes from Pre-Columbian Amerindian or Indigenous peoples and an even smaller percentage of African ancestry. The majority of the Costa Rican Population comes from Europe since it was a Spanish colony for a long time. 83.6% of the Ticos are white or mestizo, 6.7% mulattoes, 2.4% Native American and 1.1% black or Afro-Caribbean. This makes Costa Rica one of the most ethnically homogeneous countries in Central America. After Costa Rica became independent, a lot of wealthy businessman came to the country which lead to a mix of the population, especially in the high classes. The majority of European descendants live in the Central Valley where 70% of the whole population is located. 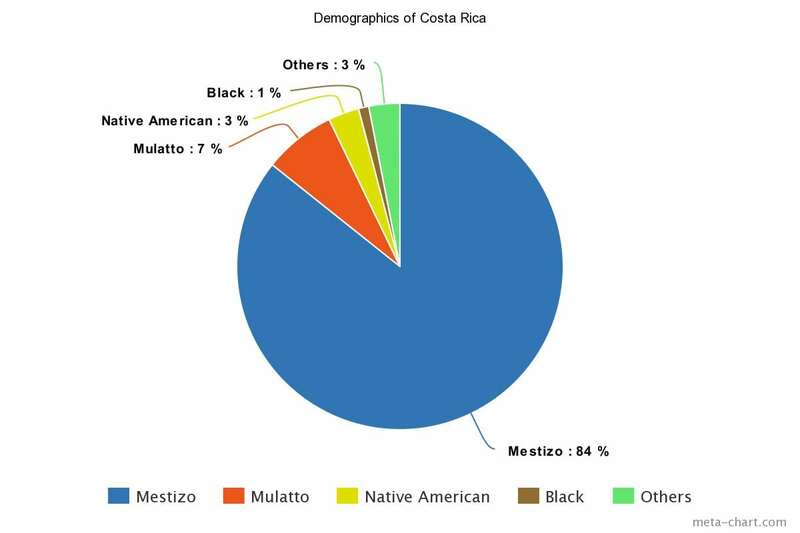 On the other hand, most Costa Ricans of Afro-Caribbean heritage reside on the Caribbean coast. About 100,000 people in Costa Rica are Native American or indigenous inhabitants who mostly live in secluded areas throughout Costa Rica. 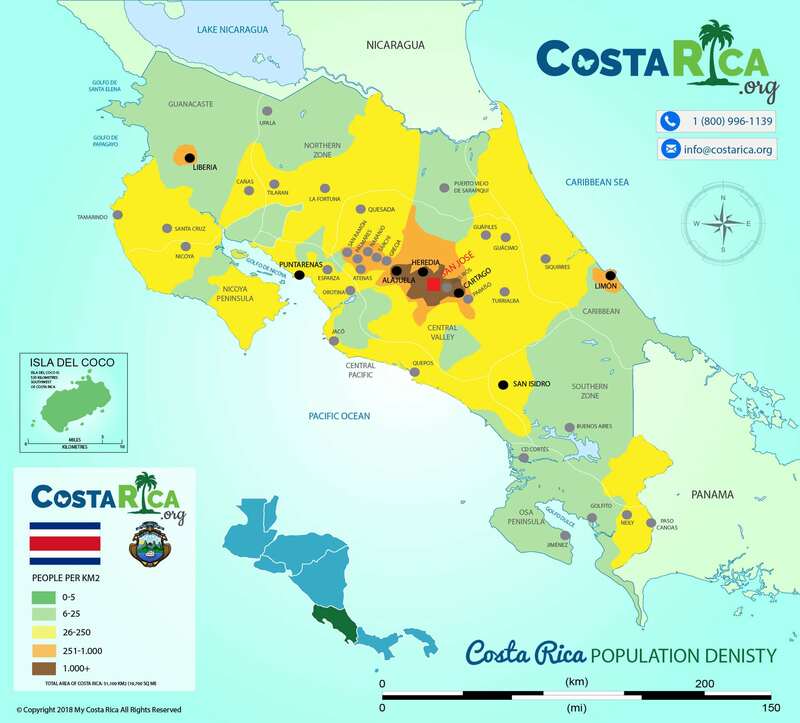 In its time as a Spanish colony, Costa Rica was isolated and sparsely populated. It was the southernmost province of the Kingdom of Guatemala. Costa Rica was far away from the capital city, lacked resources like gold or silver, and was not allowed to trade with the neighboring country of Panama. In 1719, a Spanish governor called Costa Rica “the poorest and most miserable Spanish colony in all America”. However, this helped the country to become an autonomous agrarian society. No mestizo or indigenous people class was oppressed. Let’s just say Costa Ricans don’t like to leave their country. Costa Rica has one of the smallest migration rates of the world. Only 3% of its inhabitants live outside of the country. That says a lot about the social culture of Costa Ricans. They are very family oriented and always tend to come back home. It also speaks volumes about the country itself. Costa Rica is a gorgeous country to live in, it’s safe, and the people are friendly. You can also see that it is a popular place to live in when you look at the number of immigrants. With about 420,000 immigrants, almost 10% of the population are foreigners. The most immigrants come from Nicaragua, Colombia, and United States. With all these immigrants comes a vast variety of languages spoken. The primary and official language of Costa Rica is Spanish. That said you will hear some different dialects of Spanish, including Spanish from Nicaragua, Panama, Columbia, Spain, and Mexico. Spanish in Costa Rica is unique to the area. It has unique sayings and phrases. For example Pura Vida (Pure Life) and Tuanis (Cool or laidback). Many black people, especially on the Caribbean coast, speak a traditional Jamaican dialect of English. About 10 percent of the population speak English as a second language so feel free to try out English with locals. They will more than likely be happy to test their communication skills. Other languages you might hear are German, Chinese, French, Italian or Portuguese. The official religion of Costa Rica is Catholic. You will see it in the traditions and definitely on holidays as many locals flood the streets for Holy Week or Easter. Roughly 70 percent of the Costa Rican communities are Roman Catholic. Most Costa Rican cultures are based on catholicism. All through the country, you will find big churches and even ruins that were once churches. For example the Basilica, The Ruins in Cartago, Ujaras and many others. Other religions include Evangelical Protestants and Jehovah’s Witnesses. About 10 percent of the population identifies themselves with another religion or is non-religious.